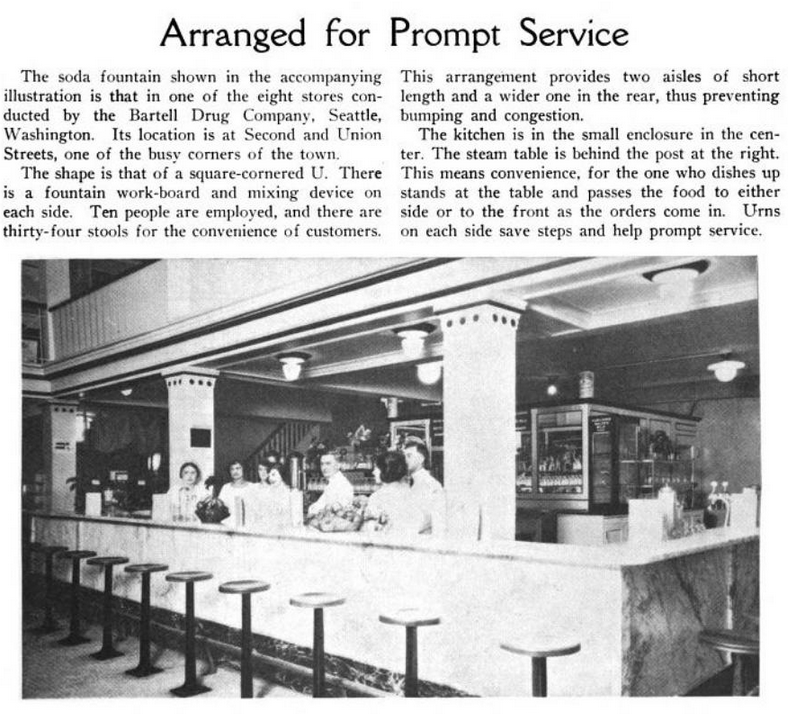 Slumberland – Since 1994: Pop culture and random commentary from Seattle, WA, USA. 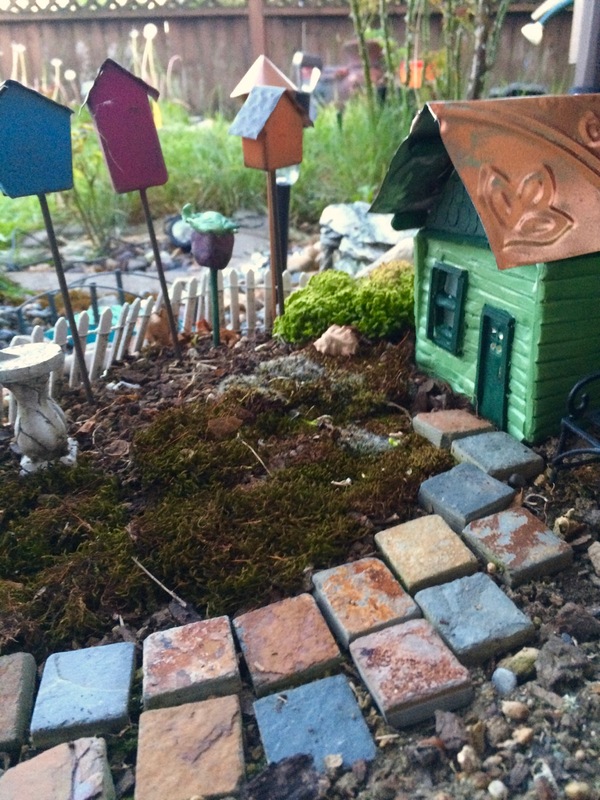 When you’re designing a miniature garden, little “fairy houses” are irresistible. A tiny castle or log cabin or Tudor house, the door ajar, surrounded by tiny trees and vines — there’s really nothing more magical. 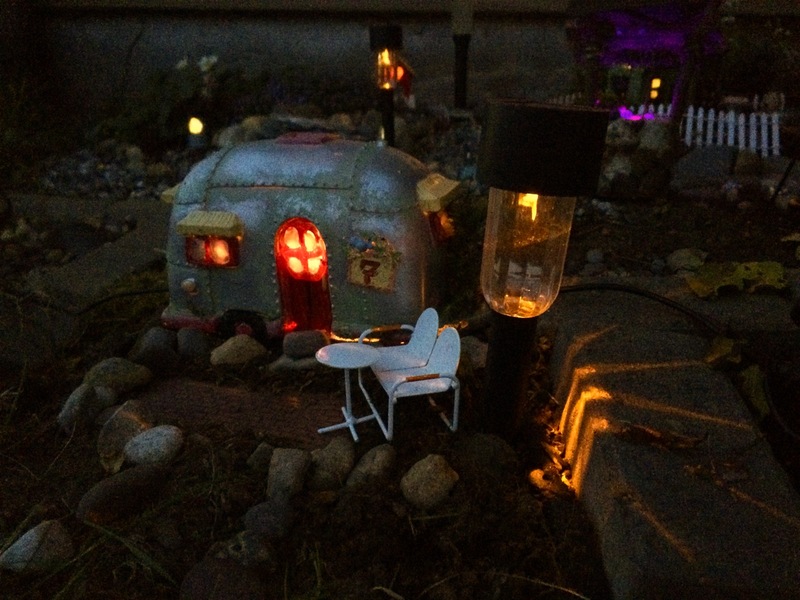 It’s even more magical if you have them light up in the evening. 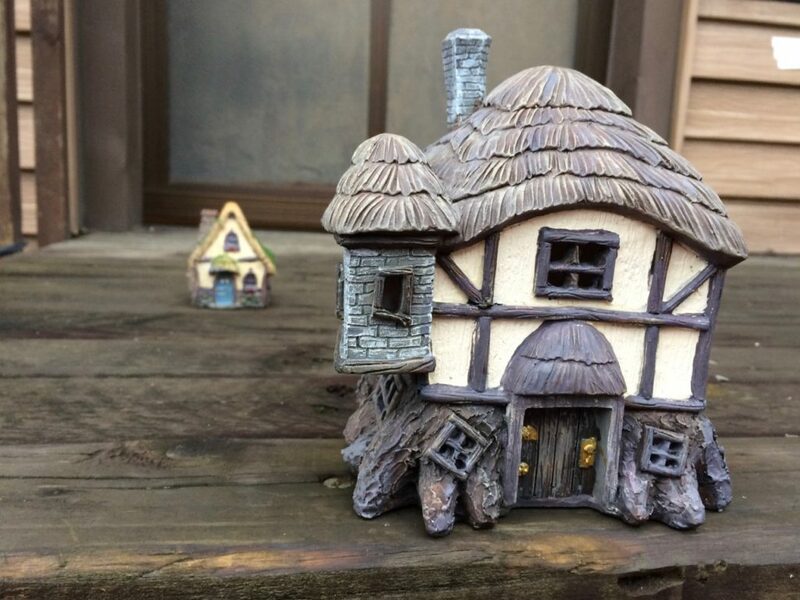 The problem, however, is that fairy garden houses are really freaking expensive. The most affordable ones tend to be painted sloppily and poorly made. Ones that are really well-made? Well, you might have to take out a mortgage to pay for them. And that’s no fun at all. 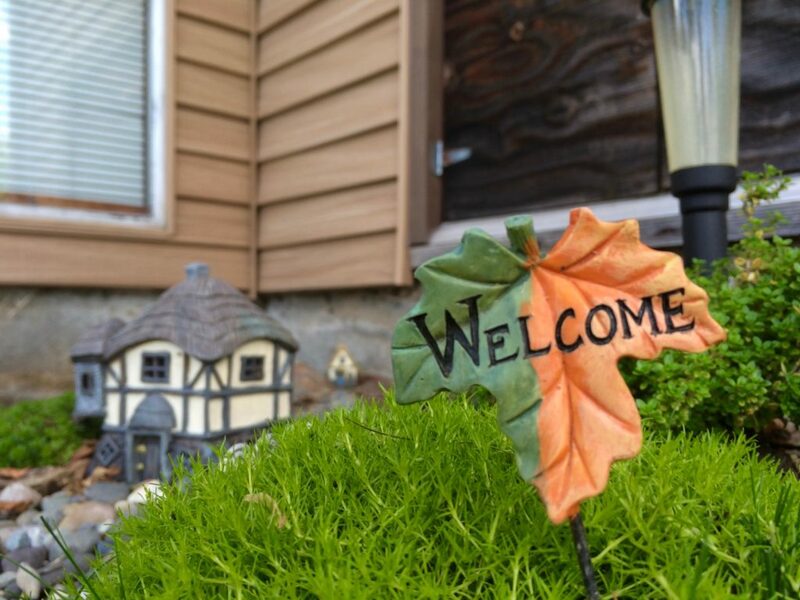 Additionally, do you really want to have the same house in your garden that everyone else does? The ones at Jo-Ann or Michael’s are cute, but what if you want your garden to be unique? There’s a simple solution to this — make your own! It’s a lot easier than it might seem. If you are a crafter, it’s likely you already have a bunch of these on hand. The only thing I had to buy was the clay. First, you will want to cut the bottles down a bit. Cut the base off of each, and then you can cut the neck to make it shorter, cut off a side so the bottles can attach more closely to each other, etc. It’s up to you. Set the lids aside — you might or might not use them later. Hot glue the bottles into position. You can see in the picture that I used two bottles together, and glued them side by side. 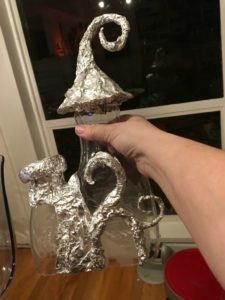 Then take your foil and start molding it into shapes, such as an arch to go around a doorway, and a smooth curve where bottles are joined, if you are using multiple bottles. Hot glue the foil onto the bottles. 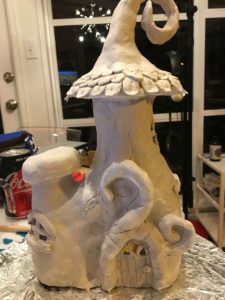 If you want to have features that look like stems or vines, as I did, use craft wire to create an armature for each structure, then mold foil around the armatures. Again, glue these to the bottles. You can use the bottle lids as bases for roofs for your house. You can also use other items such as craft sticks for these structures. Glue them on too. Now, it’s clay time! Get out your air-hardening clay. 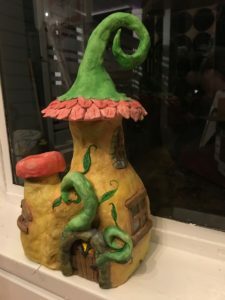 Roll out pieces of clay, wet your hands down well, and start smoothing the clay onto the structures you’ve created. Keep your hands wet and the surface of the clay wet to smooth it down. Cover the foil structures you have made. Use a blade to cut away spaces that will become windows. 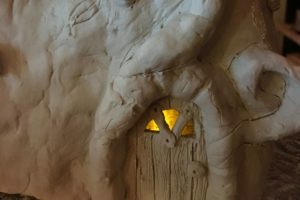 You can also use a blade or a pin to sculpt the clay to look like wood grain or other textures. 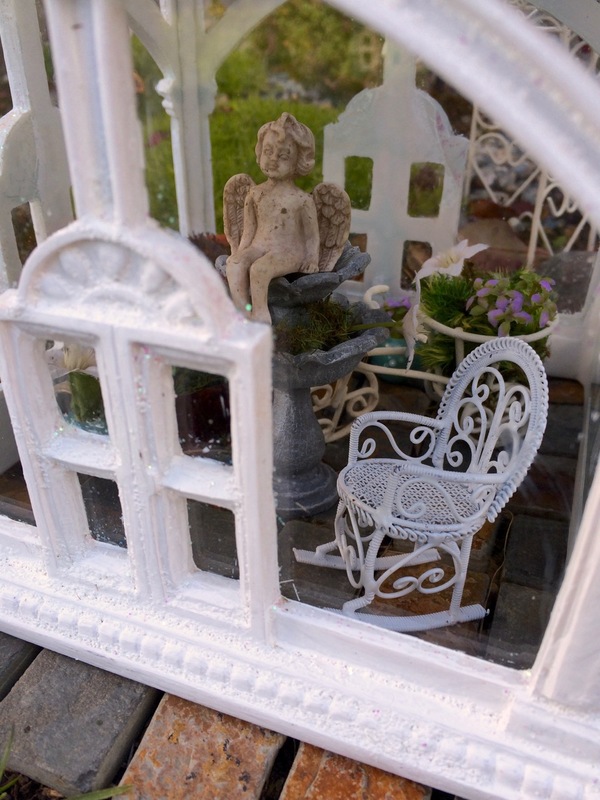 Using more clay, add windowsills and any other items your house needs. Set the house aside to dry for at least 24 hours. Once it’s dry, it’s time to paint. You don’t need any special type of paint. Watercolor works well, and is very forgiving for this. Start painting the house, and use multiple layers of color to make it look more realistic. Let your layers dry a bit before continuing, but since they are watercolors it’s a short wait. 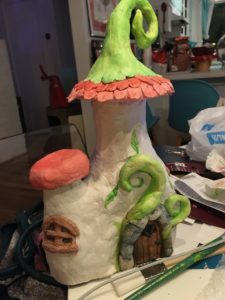 Once the paint is dry, all that remains is to put some LED lighting inside if you like, and you might consider spraying a protective varnish of some sort on the outside if it will be spending much time outdoors. You’ll want to protect the paint from water and UV light. And there you have it! This one is actually the second one I’ve made. (The first one is the tiny one on the left of the picture below.) I know I can make them even better with some practice. 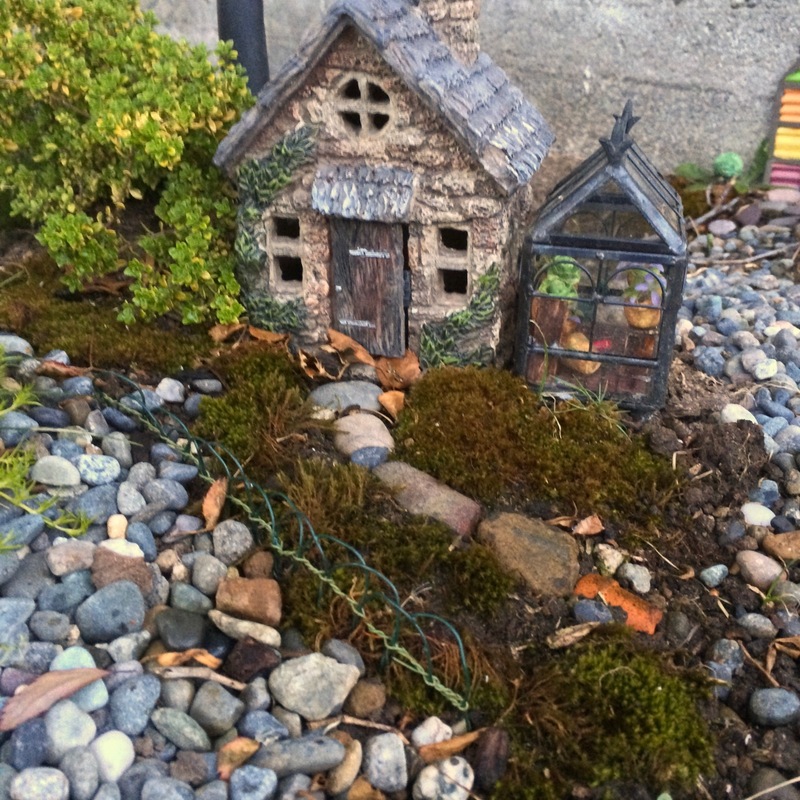 I love that I have a miniature house for my garden that no one else has! I must give credit to Creative Mom on YouTube, who inspired me with this video. 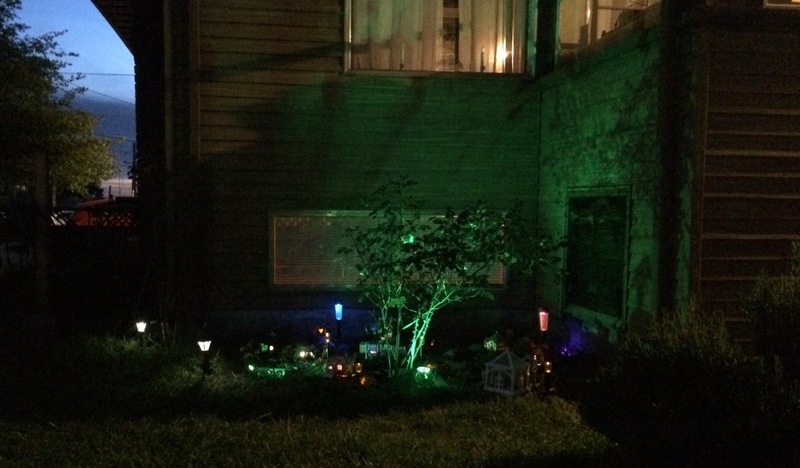 Her houses are much more professional appearing than mine, but I think with more practice I can get there. 🙂 And even one that isn’t perfect is pretty darned neat. Wow, it’s been a long time since I’ve posted here! Well, moving across the country can do that to you. I have a lot of potential posts saved up, and I hope I will be able to get to them soon. 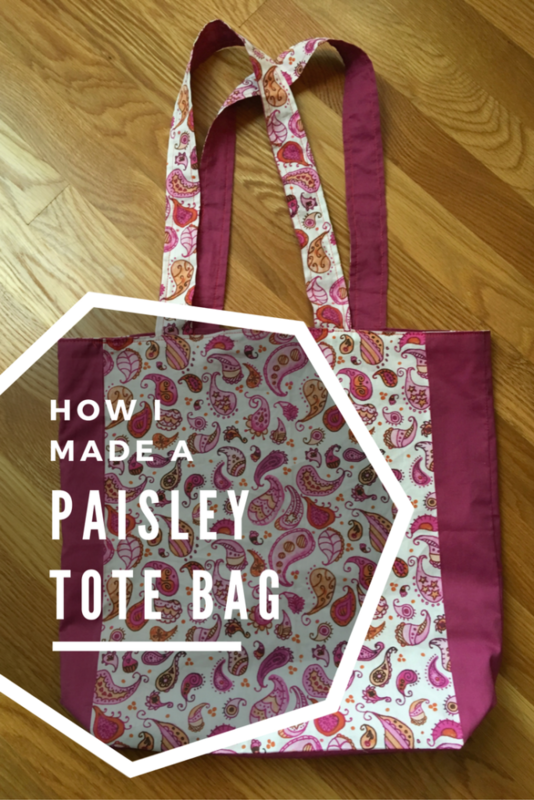 Here’s a quick little project I just finished up last night: a simple paisley tote bag. What’s cool about this one? I designed the fabric myself! I’ve designed fabric patterns for Spoonflower off and on for a while, but despite that, I’ve never actually made anything out of the fabric I designed. I only have swatches of each design on hand. I really wanted to try to make something, but I wanted something quick and easy. 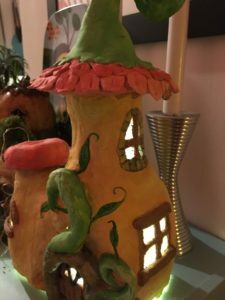 So, you want to have a fairy garden. Before you get started, there are a few things you should consider. 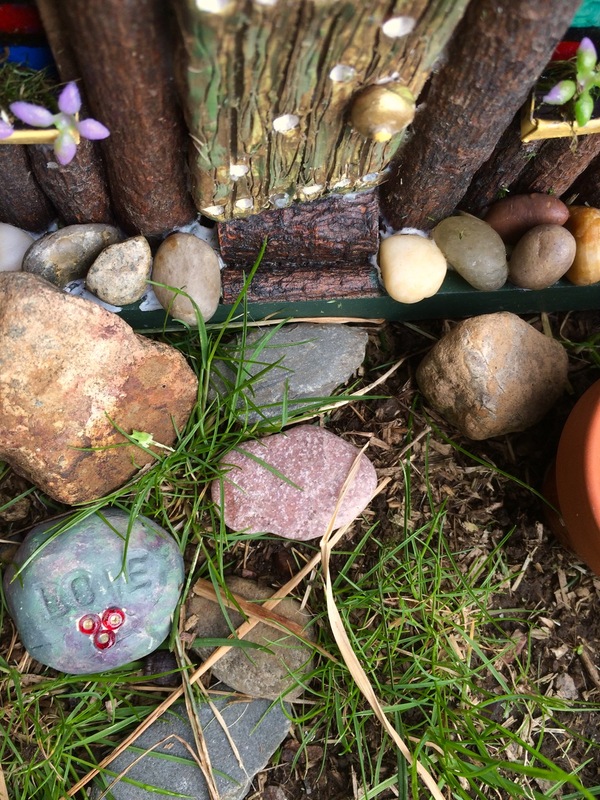 Some of them I remembered to consider myself; others were hard-won wisdom after I’d been working on my miniature garden for a while. No matter what, though, remember that you are doing this to make something you love. In the end, no matter what suggestions I make, the decisions are yours — and if you like what you created, then you made the right ones! Think about the space you have available and what you might want to fit there. This was one of the earliest stages of my garden; I built some tiny hills and rockeries and planned where some of the houses might go. 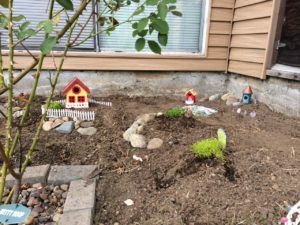 First: What do you want your garden to be? Location: There are three basic locations for gardens, in a general sense. Portable indoors gardens are set up in a dish, or a basket, or a flowerpot, or some other container, and kept indoors. Because they are indoors, you don’t have to worry about weatherproofing or things like that. Portable outdoors gardens are the same thing, but they stay outdoors. Sometimes they are in large containers like old wheelbarrows. In-ground gardens are not portable at all. 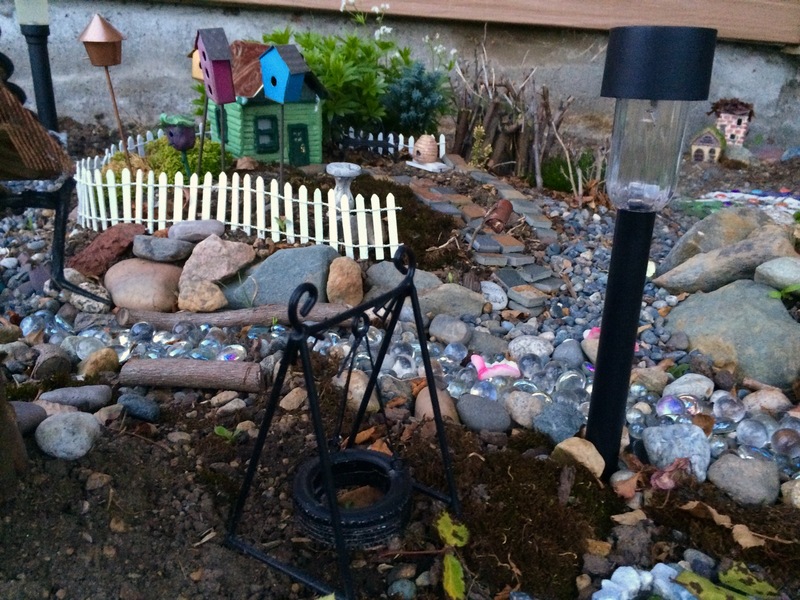 They are right in the ground like any other garden feature. Size: Once you know your location, you have an idea what size you need. 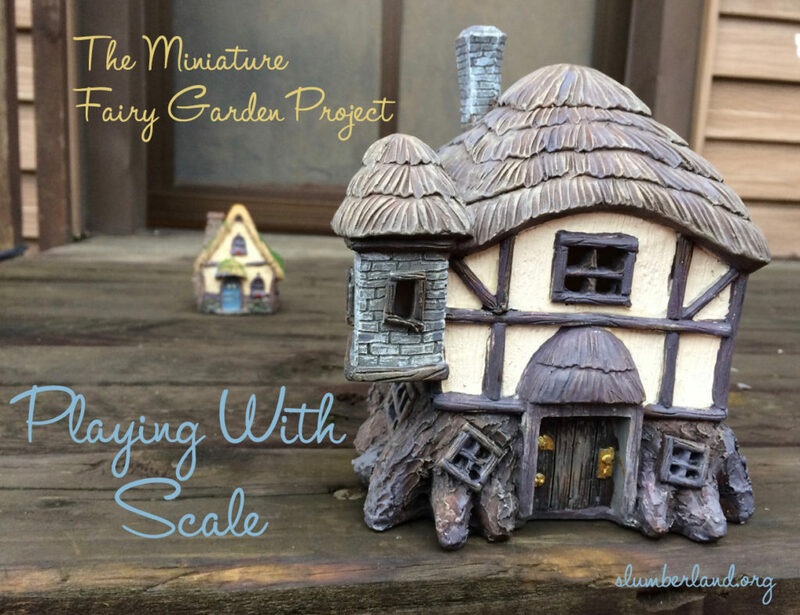 Fairy gardens can be tiny — tiny enough to fit in a teacup! But there are also some that are very large. The space available will help you decide. When? 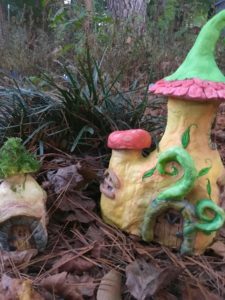 : The vast majority of fairy gardens people make are spring and summer things. They set them up in the spring, then when fall arrives, they take it down and set everything aside for next year. But there are others that are year-round. (Mine is one of those.) There are also some that are specifically set up for holidays like Christmas. 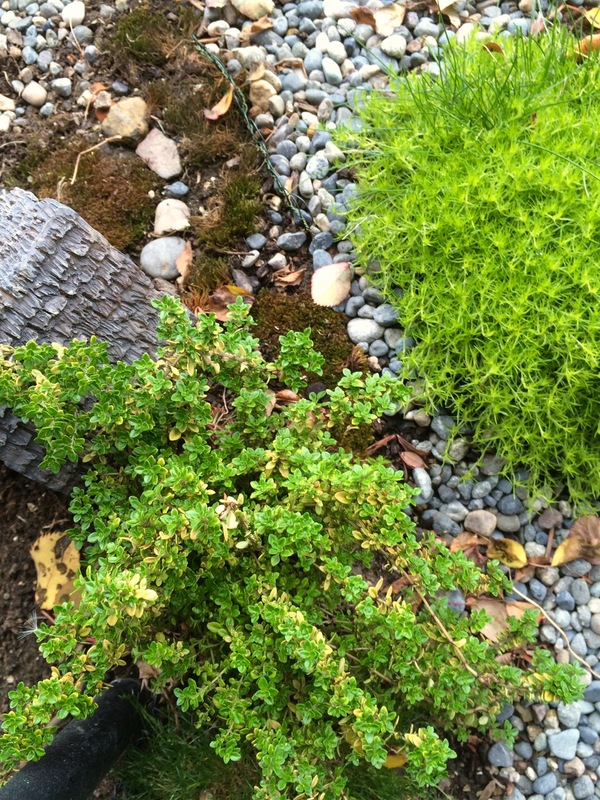 If you are going to do an in-ground year-round garden, as I do, you need to prepare it for winter weather. Theme: You don’t have to have a specific theme, but it’s common to have a general direction. What will your garden look like? Common themes include Park, Village, Beach, Farm/Garden, Fantasy, or some mixture of these. Mine, for example, is a miniature village. If you chose a theme, it will help you narrow down your choices when you’re deciding what you want to add. But you don’t have to stick to any theme unless you want to. 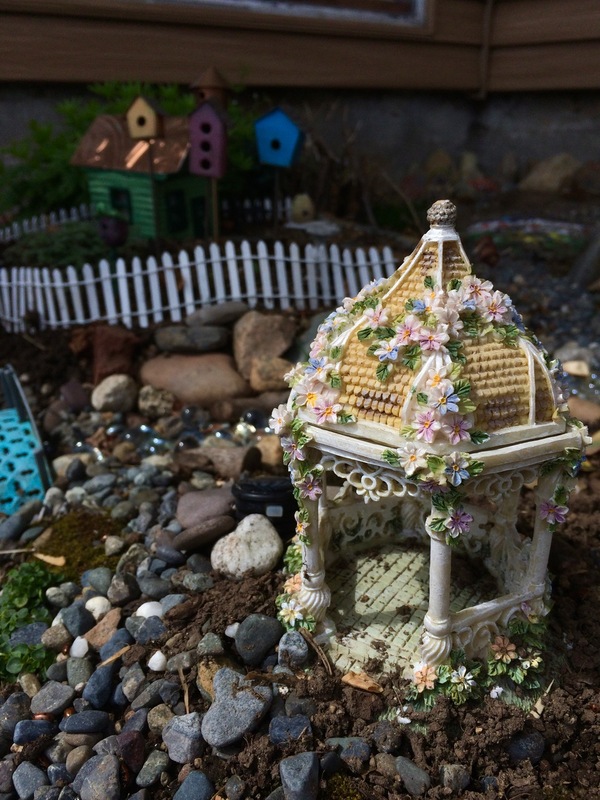 Style: This ties in to the next topic, “Which type of gardener are you?” Basically this is the sort of garden you want to do — one that is toy-based, so children can play in it; one that is whimsical and fantastic; or one that is so realistic that in a photo, you can’t even tell it’s miniature. 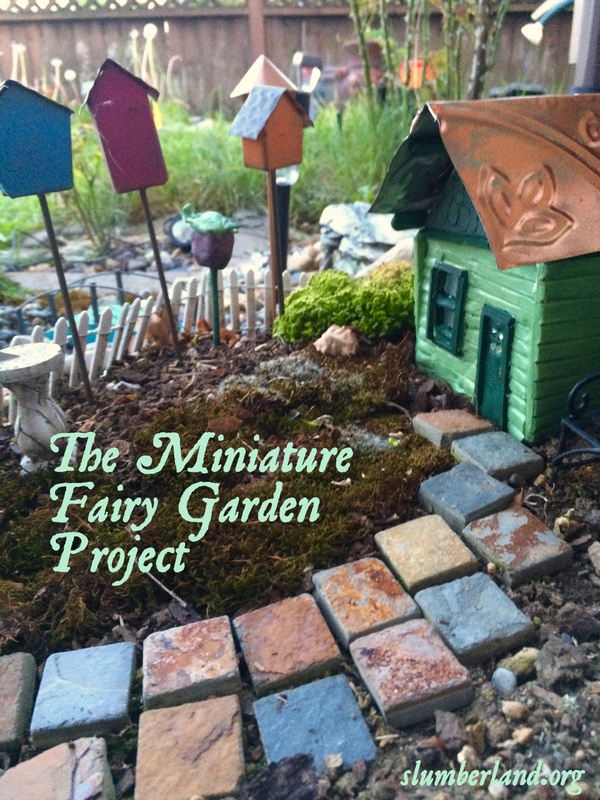 A related decision: do you want fairy figures in your garden? Some people do, some people don’t. 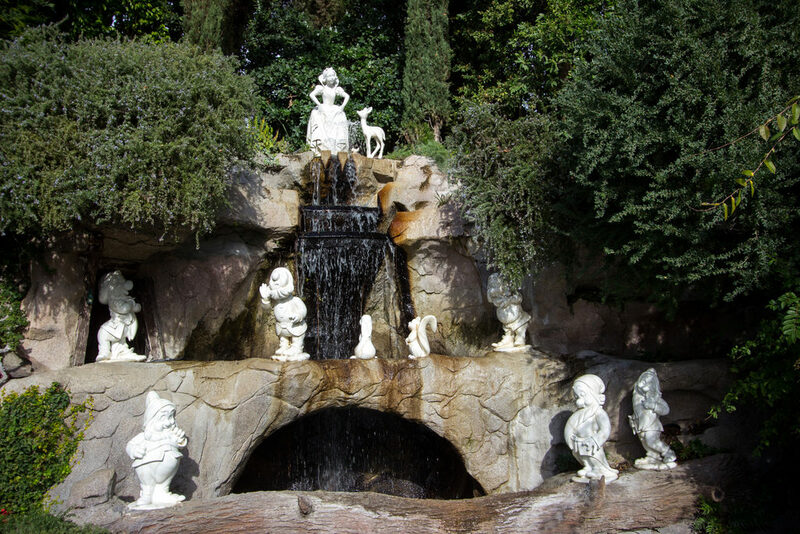 If you do, that will also relate to the size you choose for your other garden fixtures. The first three plants went into the garden in September. So tiny! Next, what sort of gardener are you? Purist: Everything looks like the fairies made it out of stuff they found. Think “The Borrowers.” Houses and accessories might be made of twigs, pencils, buttons, paper clips, ribbons, bottle caps, etc. 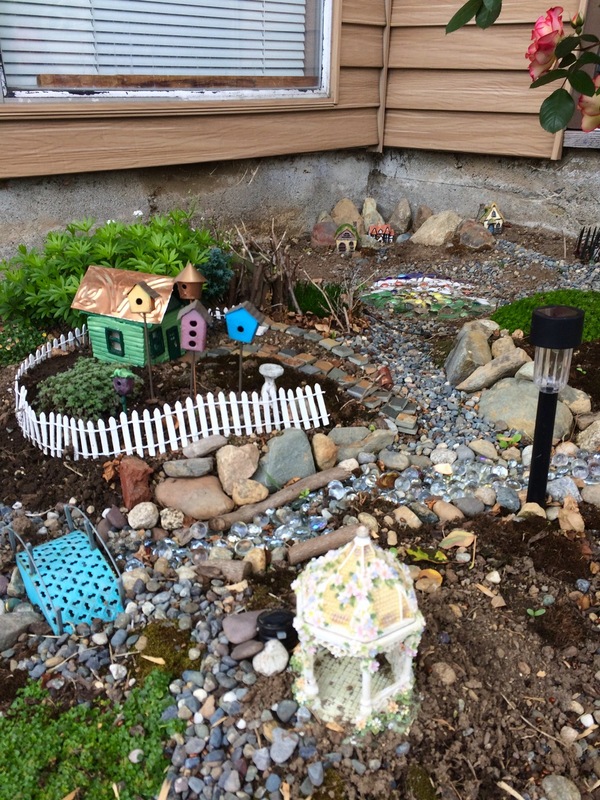 It’s not about realism, but instead making it look like the fairies have created a space in the human world. 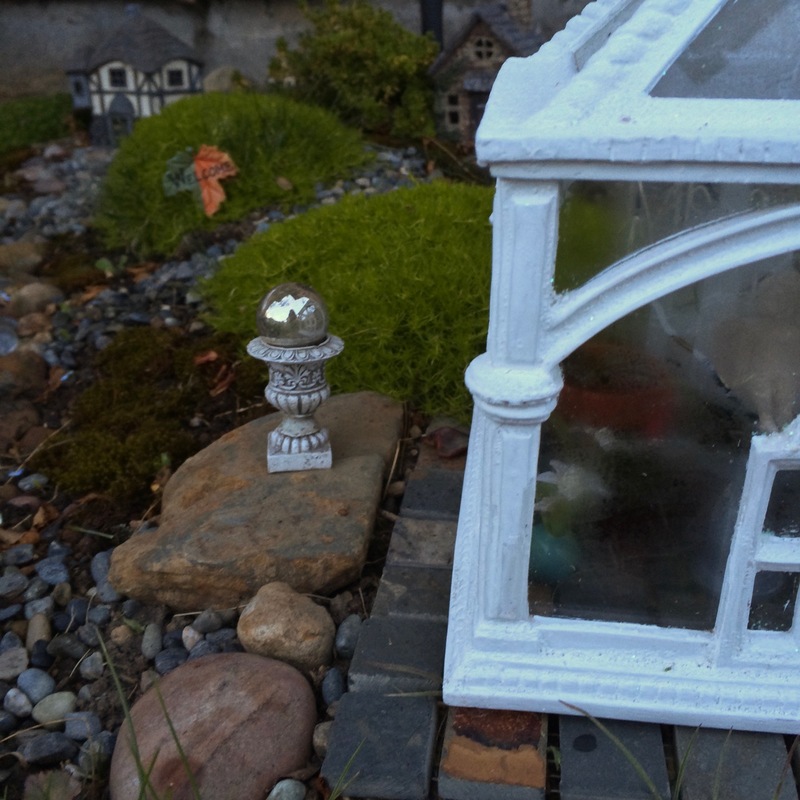 Miniaturist: Small is what matters. You might have miniature animals, etc. You’re non-purist about what is included as long as it is small. Playgrounder: The garden is to be played in, and that is the priority. You design it so kids can move around in or around it, and play with the figures and accessories. Cutista: Cute is your priority. Realism, accuracy, and coherent style are not as important. It just needs to be adorable. People squee when they see your garden, and rightfully so. Gardener: You’re doing this for the plants. 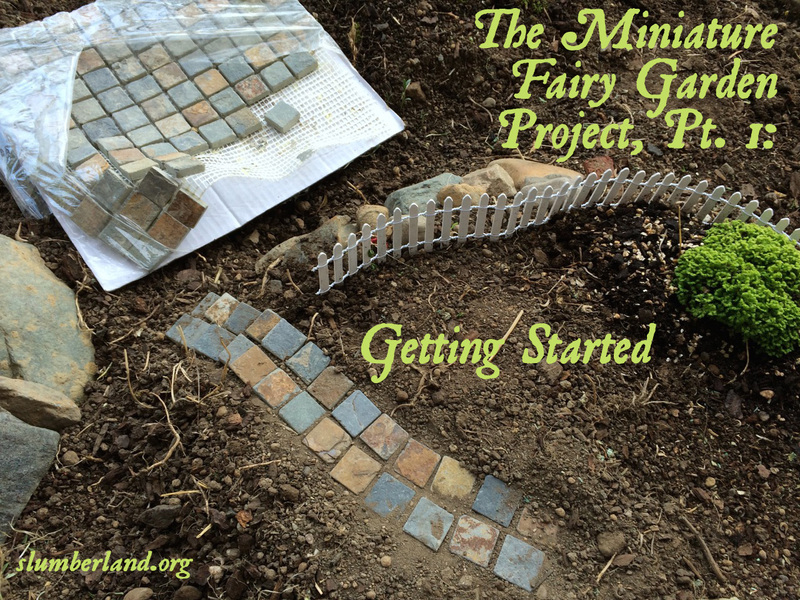 Your fairy garden will be very, very green. Combination: Any or all of these! This is probably most common. Or, you can just wing it. That’s OK, too! I’ll stop right here for now. 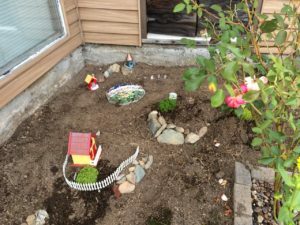 The next post will address a few more things to consider when creating or buying, as well as some “magic tips” to help make your garden come to life. If you’ve tried to buy a frame for a large poster-sized print lately, you know how frustrating it is. Nice frames that size are ridiculously expensive. Other frames are less ridiculously expensive, but look cheap. Just tacking or taping the posters to the wall gets old once you’ve graduated from college dorm walls. I have a ton of large movie posters I want to hang in my home, but they aren’t hanging yet because framing them is a big investment. New "engineer print" of one of my photos, from #parabopress! Thanks to D. for the Christmas gift card! I kept looking at the prices and thinking “No, I can’t justify buying one.” But I didn’t want to get one of the “fauxdoris”, either. The thing about Midoris is that they are a bit like Apple products in that they are not just nice products, but they are beautifully designed and packaged and they feel a bit like a treasure to open. Fake Midoris often do not have that quality, though of course some do, and many of them just looked… cheap. The ones that didn’t were expensive, like real Midoris. And even the ones that looked good usually didn’t have that quality of “vintage notebook that Indiana Jones would probably carry around” that I was looking for. 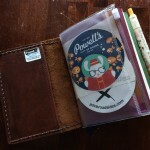 One Traveler’s size journal, one Passport journal, one pen case. 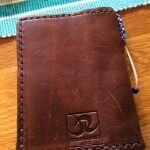 The large journal came with two graph inserts, a calendar, and a plastic card holder/pocket insert. The calendar insert is a “free calendar”; you can use it for any month you want. 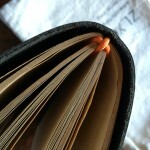 This shows how nicely the ZLYC journals use elastic to hold the inserts. 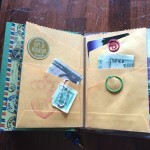 This is the Passport journal. 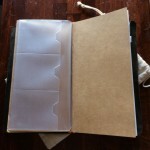 The ZLYC journal came with these kraft inserts. 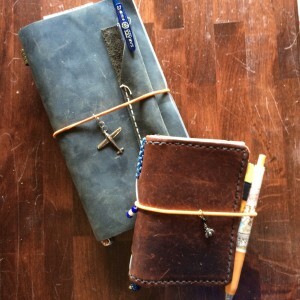 Both ZLYC journals. As you can see, the leather scratches if you look at it funny. But that’s OK. It will develop character as I use it. Let’s just say I was impressed. 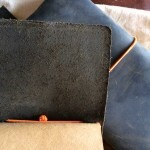 The leather was perfect — thin and flexible and yet with some good heft to it. It is nice to hold on to. It smelled good, not of chemicals or mildew. They were put together nicely, and each book came with three random inserts (plus an extra plastic pocket insert in the large book). 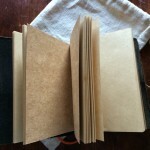 The large book had a two graph inserts, a free calendar, and the pocket insert; the small book had all kraft paper inserts. I was thrilled, and immediately started customizing the large book. 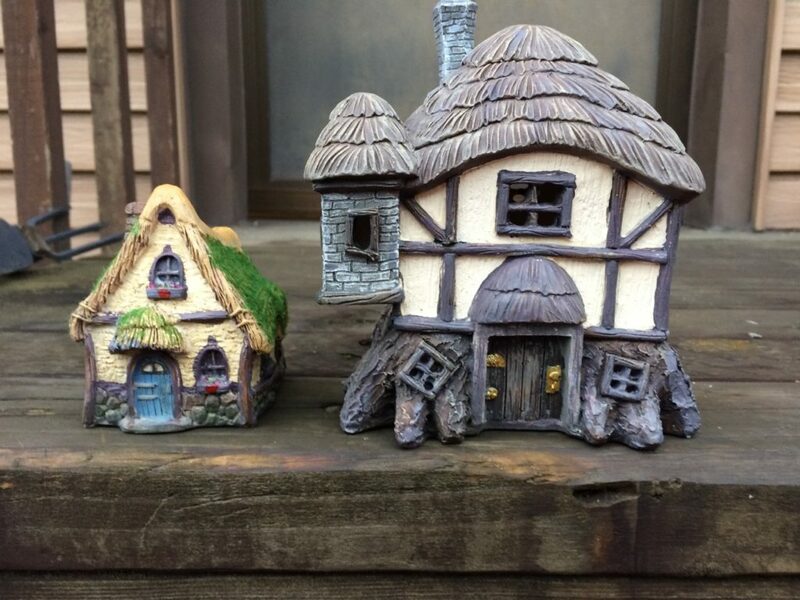 I may use the small one as a gift since I already have the other from Renaissance Arts. And now, a few days later, here’s what I have! 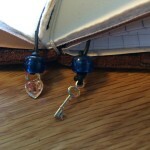 Since it’s a Traveler’s Notebook, I found an airplane charm in a box of really old earrings, and added it to the front of the journal. You can see how the leather on this gets scuffs and scratches. Eventually the wear will tell its own story. 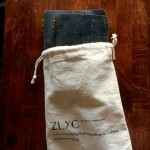 The ZLYC inserts have kraft paper covers. I put a lot of random stuff on mine. 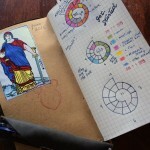 I’m experimenting with the Spiraldex system for keeping track of your time. This page is rough because I was figuring out how to draw it. This little DIY bookmark was inspired by Patrick Ng’s post at Scription. 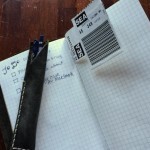 It’s made from a luggage tag, and seemed appropriate for a “traveler’s” book. Not very fancy but kind of fun. I made a bookmark out of orange/white baker’s twine (to match the elastic) and a charm I had. Here you can see a couple of differences from the Midori. 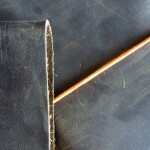 The closure elastic is attached at the spine instead of the middle of the back cover. And the bead at the top that holds it together is a bit different. This shows the bookmark when the book is closed. The charm is a beacon, or a lighthouse if you prefer. And here’s the ZLYC notebook from the top down. Not jammed quite as full as my passport-sized book. I’m terribly happy with it so far. It’s the perfect weight and feel in the hands, and it’s easy to write in. The paper is lovely — at least, the graph paper is. (Haven’t written on the other yet.) I’ve tested it with fountain pens, gel pens, all kinds of pens, and it doesn’t bleed through. It’s very smooth to write on. I’m going to have to find more of the graph inserts! I got a Midori blank paper insert for it and swapped it in for one of the graph paper ones, since I don’t need both at the same time. It fits perfectly. I have a feeling I’m going to be carrying this one around for a long time. 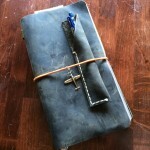 But now I’ve seen the blue limited-edition Midori notebook — uh oh. Must. use. self-control. Both notebooks I’m using now. One ZLYC, one Renaissance Art. Someday, a real Midori! But I love these. Uh-oh. I’ve got another obsession. 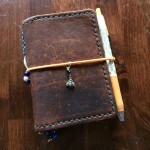 A few months ago, there was a post on Metafilter about something called the Midori Traveler’s Notebook. I had never heard of this. 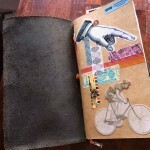 The notebooks, apparently, have a devoted cult of users who buy all kinds of accessories, customize and decorate their notebooks, and generally spend a lot of time using them as planners, sketchbooks, and more. 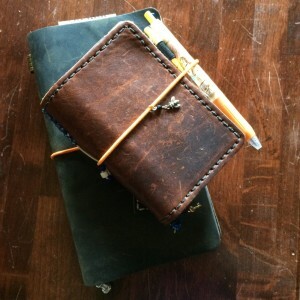 I looked at some links about the Midori notebooks, and thought they looked nice, but not anything I would use much. Though I’ve always loved stationery and journals, I’ve never used them enough. Usually I get one, write in it a few times, then never again. 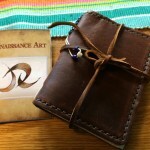 And then an online friend pointed me to a free journal offer from Renaissance Art. This one. 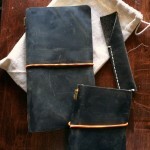 She said “Anyone interested in those Midori notebooks should try this offer. You only have to pay for shipping.” Why not? I thought. I do love journals and notebooks. 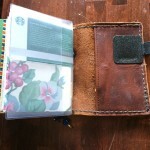 And $9.99 for a pretty leather journal? What’s not to like? It’s not a Midori-brand notebook, but it is the same size as a Midori Passport-size Traveler’s Notebook, the smaller size, so Midori refills would fit. 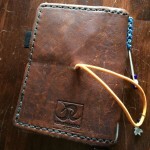 The book arrived neatly tied with leather. This photo shows the color best. It’s a gorgeous warm brown. 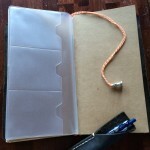 The loop with the beads can be tightened to hold refills inside the notebook. The notebook came with one refill, with a fabric cover and blank paper. This is the Arches paper in the refill that came with the notebook. The notebook was made of beautiful, buttery leather. It smelled good, like a new baseball glove. I went online to see how people use and customize their Midoris and “fauxdoris” like this one, and immediately fell head over heels into the rabbit hole. For example, see this Flickr group. 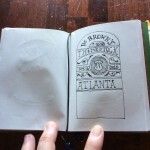 People use the books as sketchbooks, art journals, travel journals, planners, and more. What is special about them is the refillable system. Refills are held in with elastics, and you can add more elastics to hold more refills. There are a ton of different refills — graph, lined, blank, kraft paper, calendars, zip pouches, etc. It’s not difficult to make your own, either. 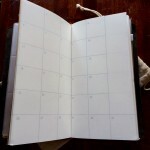 So if you want to use yours as a personal planner, you might include a calendar, a Chronodex insert, and lined paper. 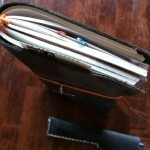 But if you want to use yours as an art journal, your inserts might include drawing paper and a pouch to carry supplies. When you fill up one of the paper inserts, you can take it out and replace it with a new one, even if the rest of your inserts aren’t used up yet. It’s endlessly customizable and flexible. Of course, I got all excited about this and started customizing mine. Of course. 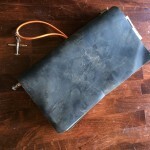 After a few weeks of wear, the leather has developed some gorgeous character. 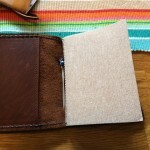 I used an awl to poke a hole in the back cover to attach this elastic. This is the same style that Midori uses, which puts a knot in the back that some people don’t like. It doesn’t bother me, though. Here you can see all the stuff I’ve put into this cover. It’s a bit overstuffed, but I like it. 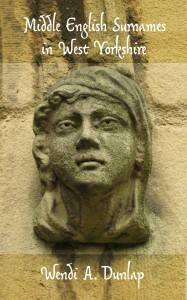 This shows something Midoris don’t have — the sewn-in pocket. It’s very handy, though it does thicken the cover. 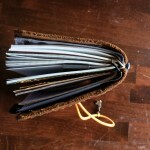 Also in this pic, a Midori passport-size zipper pouch insert. 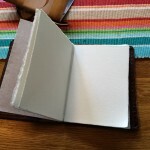 This is a Midori insert with plain paper. The sketch was just rough brainstorming with a pen. Unlike Midori, the Renaissance Art book doesn’t come with a bookmark built in. I made this out of some beading supplies I had, and just looped it under the main loops that hold the inserts in. Here’s one of the bookmarks. The graph paper is a Midori insert. I made this little multi-pocket thing myself out of a 6×9 envelope. 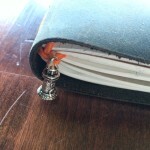 You can see the Midori rubber band that holds it into the notebook. 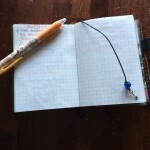 The pen loop is made by Leuchtturm. The card pocket is Midori. I made the insert behind it — it’s graph paper with a cover made out of an old wallpaper sample. I love the book and have been using it a lot. But. It wasn’t enough. 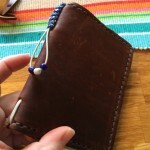 It’s a bit small for writing, and might work better for me as a sort of wallet, so I wanted the larger size — maybe a real Midori? And with that cliffhanger of sorts, I’ll stop for now. Watch for Part 2. Recently there have been some shootings in my neighborhood. I felt the need to write about it a bit. So I did. You can read the article on Medium. Just wrote an article on Medium. It’s about nostalgia, and development, and the city, and the feelings caused by change. Please read and share, if you like. This year my budget for Christmas was lower than it has been in previous years. 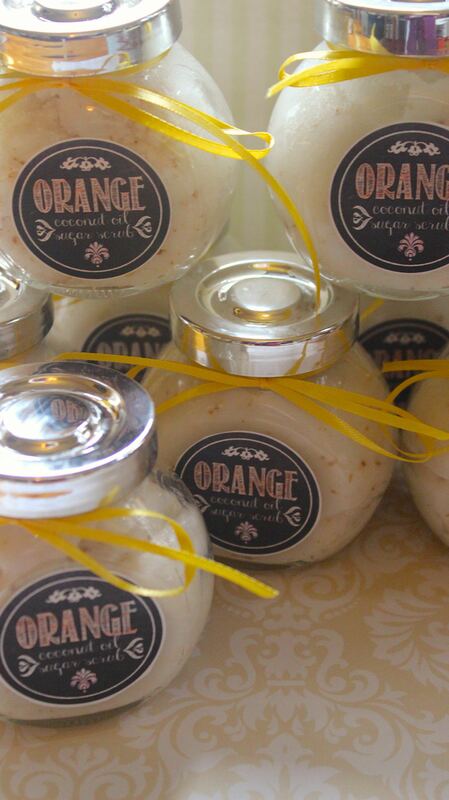 So I made some presents: orange coconut oil sugar scrubs. 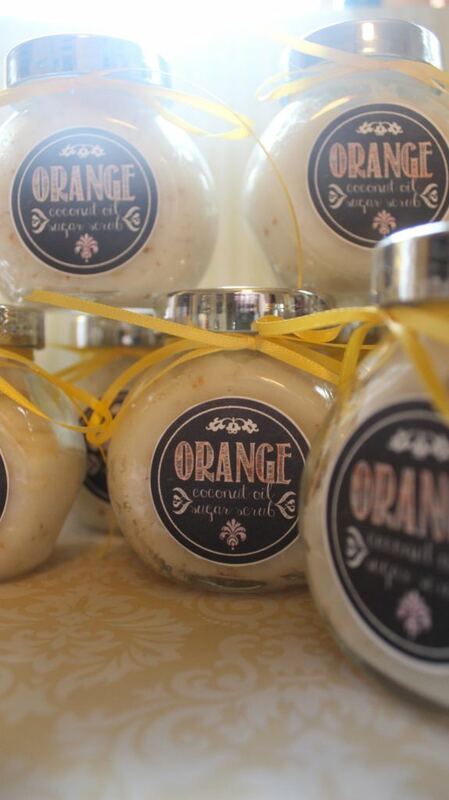 They came out perfectly — they smell great and do an excellent job of exfoliating and moisturizing the skin. I love this stuff. As it turned out, the folks I gave it to loved it as well. I may have to do it again. The sugar and coconut oil are roughly a 1:1 mixture, but you can adjust it depending on what you want your scrub to be like. I used orange essential oil, just a bit, and dried orange peel from Penzey’s. The jars were from IKEA ($3.99 for a package of 4). I made the labels myself in Photoshop. 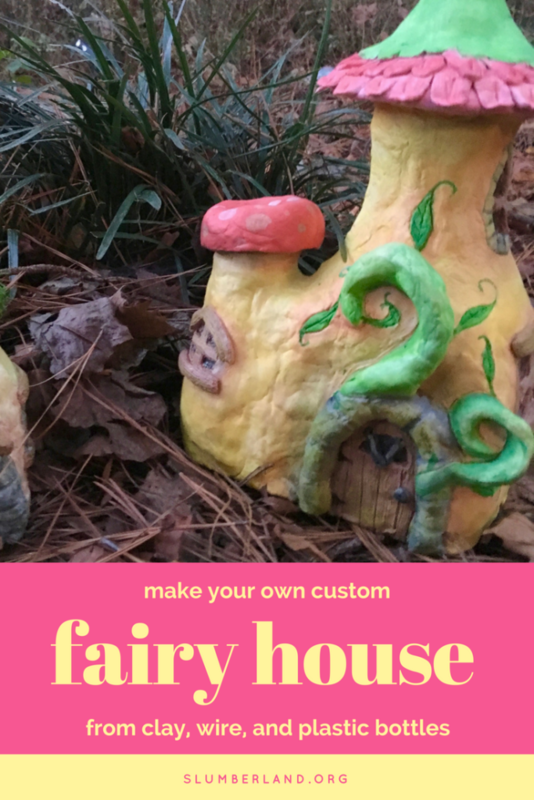 I was inspired by this project, which has been pinned on Pinterest more than 19,000 times! Sometimes Pinterest-inspired stuff can fail pretty badly, but I’ve had relatively good luck with them, and this one was an unqualified success. I have a stairway that goes up to the attic level of my house (that’s where my bedroom is, though originally the attic was unfinished.) The stairway was last painted some decades ago with boring gray floor paint. The walls are dingy “landlord white.” I’ve meant to do something with the stairway for 18 years, but was never sure exactly what. Bright colored steps? Dark? Wood-finish? And what to do with the walls? I spent a lot of time looking for ideas and inspiration. I made a Pinterest board that currently contains 244 pins of interesting staircases. But the solution to the stairway eluded me. This is about the best the stairs ever looked before now. Because you are far enough away not to see the flaws. You can see in the photo what my stairs looked like. Plain gray, with a curtain to hide them (and keep the heat downstairs when necessary). They look better in the picture than they did in reality. In reality, they are so dull, old, and dirty-looking. No amount of cleaning makes them look nice. 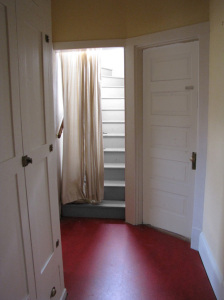 Redoing them is an annoying task — finding the right floor paint, and the right color, and setting up a gate to keep the cat off the stairs, and keeping off the stairs myself while the paint dries. I just haven’t had time to think about it much. But I realized that I could just decorate the risers — the front part of each step — without much fuss. I could draw on them, paper them, paint something, whatever. Eventually when I redo the whole stairway — which I still need and intend to do — I can remove or paint over whatever I do now. Yes, I’m a Beatles fan. How did you know? The risers are now chalkboards, and I can change the lettering any time I like. Or I can just draw things on them. I could even write reminders on them like “Don’t forget to pick up the laundry while you’re up there!” if I wanted to. The top of each step is still the ugly old gray paint. 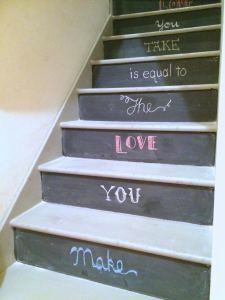 But even with the dingy grey steps and white walls, the stairs look 100% better than they did before, and the whimsy of my chalkboard steps makes me smile whenever I see them. It’s also a fun place to practice some chalkboard lettering styles. 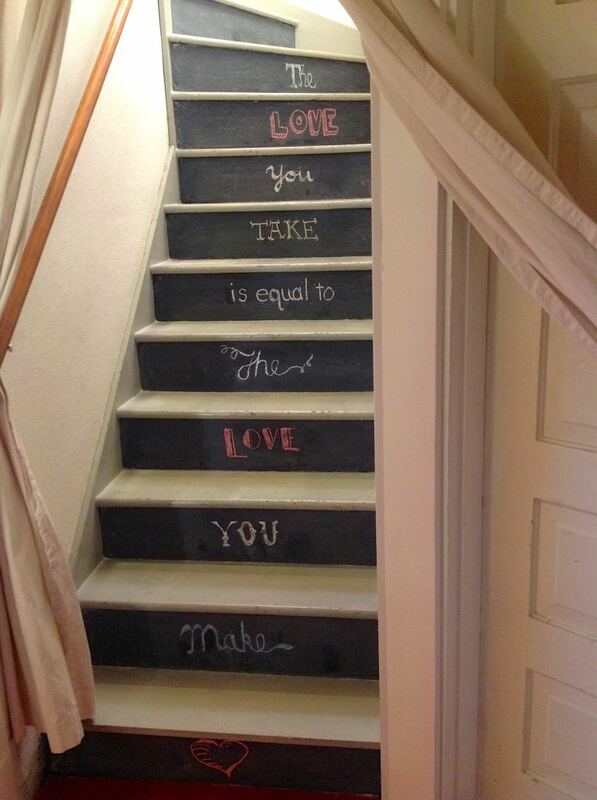 Chalk is pretty forgiving! Some of these words were easy to write, and others involved some erasing before I was happy with them. Clean the surface you are going to paint. If it’s rough, sand it or your writing surface won’t work well. 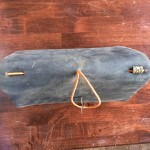 (I didn’t need to do this — the surface is a bit rough here and there, but it seems to be OK.) Paint a coat of chalkboard paint. At this point, you’ll probably ooh and ahh at the deep, rich black finish. That is, if you use black paint. Chalkboard paint really does look nice when it hasn’t been chalked on yet! Now comes the hard part. If you’re like me, you want to start writing on your new chalkboard steps! But you can’t. You have to wait three days for the paint to cure. Three days! If you don’t do this, I’m told that the words you write on the board might be permanent. And you don’t want your steps to be that unforgiving, do you? So be patient, and wait. Eventually, I’ll paint the walls and the steps and brighten this area up a bit. I may or may not keep the chalkboard risers at that time. But in the meantime, I have something I can enjoy, in a part of my home that always depressed me before. My bedroom makeover is featured today in a post on Apartment Therapy! Cool, huh?